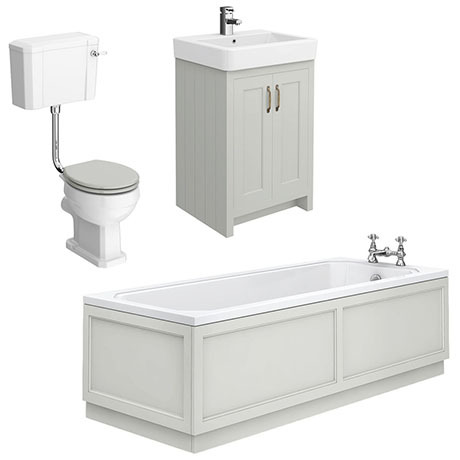 A high-quality traditional bathroom suite with a satin grey finish from the Chatsworth range, ideal for creating a period look in your bathroom. Manufactured to a high standard, the stylish vanity unit features a internal shelf which provides generous storage space for your toiletries, helping to keep your bathroom clutter free. It's clean classical design blends beautifully with the Art Deco styled acrylic bathtub, comes with a pre-drilled waste and overflow holes, and also includes a set of bath legs. Each bath panel comes with a plinth to attach to the bottom of the panel to raise your bath an extra 150mm. The traditional low level toilet with seat features quick release hinges for easy cleaning. Toilet has been manufactured using high-grade vitreous china ensuring a quality finish and long lasting durability.